« My 5th Christmas: The quilt that made me cry. Due to the myriad number of ways that space travel is hazardous to humans, and given the sheer vastness of the universe and the possibilities that it contains, science fiction and horror easily go hand in hand. Join me this week on The Uncommon Geek for a look at a circa 1997 take on science fiction horror, Event Horizon. I remember seeing trailers for Event Horizon back in the late 1990s; mostly via VHS tapes of various other Paramount films, Star Trek being chief among them. I remember being fascinated by the imagery and concept, but as I was never a big fan of horror films, I never committed to watching the film from start to finish until years later. Since more years have passed, and I now have a greater understanding of the concepts behind the movie, as well as the fact that this review is a special request from a follower of The Uncommon Geek site, let’s re-visit this macabre film. Event Horizon takes place in the not terribly distant future of the 21st Century, showing us a humanity that has managed to leave the confines of Earth, and has begun exploiting the other worlds of the Solar System. Travel between worlds is shown to still be difficult and time-consuming, but much more practical than in our present day. The first act also establishes the leading character in the movie, Dr. William Weir (played by Sam Neill), a man having obviously endured a recent trauma connected to his wife. The initial dream sequence he endures turns out to be quite prophetic, which is something I will connect the dots on later. Other than the interesting nightmare, however, this scene felt too much like Ripley’s dream sequence in the beginning of Aliens; indeed, even the room Weir is in looks astonishingly like the medical station in that film. The exterior of the space station that Weir wakes up on, also looks quite bizarre for a human construction; it reminded me more of the framework of a Borg cube than something we would ever build. Also similar to Aliens, is the way space travel is handled in Event Horizon, as well as the way Earth society has bled out into space. The militaries and corporate entities of Earth are definitely running the show here, sadly. Ion drives are used on the spaceships, which makes travel between planets more feasible than with today’s rockets, but the crews have to be put into stasis pods just like in the Alien movies, to avoid having their skulls liquified. How these stasis units protect the crew isn’t really explained, but given the pace at which the plot moves forward, this film seems only as sure of its science and tech as it needs to be in order to keep the story going. Dr. Weir ends up joining the crew of the spaceship Lewis and Clark, a rescue vessel that is dispatched to investigate the re-emergence of humanity’s first starship, the Event Horizon. The Event Horizon is Dr. Weir’s brain child, and after it had been gone and presumed destroyed for 7 years, its return presents the troubling questions: where has the ship been, and what happened to its crew? The starship’s return also nurtures an obsession within Dr. Weir, who treats the re-appearance of Event Horizon not unlike that of a parent having a lost child returned to them. The first scene on board Lewis and Clark introduces us quickly to the principal characters, and delivers the majority of the plot exposition. This crew is a fairly close facsimile of the marine crew in Aliens; mostly a mix of smartass, soldier, stoic, and young rookie character stereotypes. The actors here handle their roles ably enough, but save for Captain Miller (Laurence Fishburne), I don’t consider these characters to be particularly memorable. They just aren’t well developed enough; like the tech in the film, they are given just enough material to service the plot. The distress call that the crew examines in this scene has just enough information to get them interested, but provides no real clue as to what they may find. Also, the styling of the effectively disturbing, garbled transmission seems to have been riffed off of in later media, with Mass Effect and especially Dead Space coming to mind immediately. By tracing the distress signal, Lewis and Clark ends up finding Event Horizon trapped in a decaying orbit around Neptune. Neptune is a planet that seems to be often ignored, both in science fiction media and in real life, so I enjoyed seeing it utilized here. The initial reveal scene of Event Horizon is very effective in tone and atmosphere, utilizing the dark and ominous setting of a violent storm in Neptune’s upper ionosphere. I’m a little dubious as to how the relatively small Lewis and Clark manages to function so well amidst Neptune’s absolutely massive gravitational pull, but again, with this tale emphasizing horror and suspense over science, it’s a detail skirted over for the sake of the story. The Event Horizon itself is a very interesting ship design, and I find it to be fairly unique and original overall. The front of the ship rather resembles an oversized, armored train, with a long, spine-like bottleneck connecting to an engineering section which somewhat looks like a Klingon battlecruiser from Star Trek. It’s an impressive model, and it definitely looks the part of a ship that can travel to distant parts of the galaxy. The inside of the ship, however, is a different story. It is appropriately macabre, dark, and sinister, and much of the architecture and styling of the ship’s interior is based upon Notre Dame cathedral. While these details are appropriate for making the audience (not to mention the characters) feel uneasy, I can’t believe that any human would willingly design such an uncomfortable, twisted looking ship that people are supposed to live and work on. I certainly wouldn’t want to serve on this ship after taking more than a few steps into it. The corridor leading to engineering quite literally looks like a meat-grinder; the Gravity Drive looks more like Hellraiser’s puzzle box than a plausible piece of technology; and there are gross looking spikes all along the walls of engineering that appear to serve no purpose aside from looking sinister. All of these details, again, are effective at inducing a sense of uneasiness, but for me, really killed my suspension of disbelief. The crew of Lewis and Clark only gradually begin to piece together what happened to Event Horizon’s personnel, while they begin to experience strange phenomena. At first most of the disturbances are chalked up as intense hallucinations, but an attempted suicide by a crew member via decompression changes that tone quickly (the decompression event is handled with reasonable accuracy, which is surprising considering how many Hollywood movies have butchered the idea). However, by the time Captain Miller decides that the jig is up and Event Horizon needs to be destroyed, Dr. Weir has already become partially possessed by the ship. The twisted Doctor delays and sabotages Miller’s efforts to leave, ultimately going as far as to blow up the Lewis and Clark. Event Horizon, from here on, settles on what I consider to be a fairly pedestrian horror movie pattern. The first half of the movie was content to be suspenseful and atmospheric; the latter half is more about escalating horror, shock, gore, and racking up the body count. Like in any typical horror story, the crew gets picked off by the ship one by one. Whether the Event Horizon itself is actually now its own sentient being, or is merely acting as a host for a lifeforce from the other dimension, is not really explained, but in either instance it has the ability to reach into the darkest depths of a human’s subconscious, and to torture them with their worst nightmares. Dr. Weir doesn’t get tortured as much as seduced by the ship, which presents itself to him in the form of his dead wife. Along with his already strong attachment to the ship which he designed, in this way he becomes an effective, willing host for whatever force Event Horizon brought back with it. In the final acts, Weir becomes fully possessed, and in a showdown with Miller shows what will happen to the remaining crew of Lewis and Clark when Event Horizon returns to the other dimension. Whatever dimension that is, is implied to be either the satanic Hell, or some plane of pure chaos. Purportedly, director Paul W.S. Anderson, in his original director’s cut, had presented a more explicit explanation of just where Event Horizon had been, but this was cut from the theatrical release. 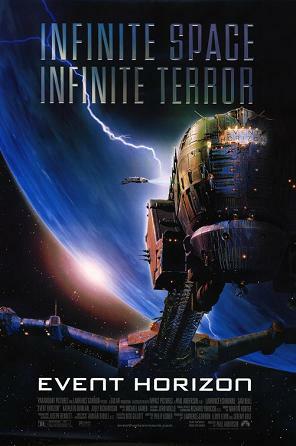 So ultimately, I found Event Horizon to be somewhat entertaining overall, more for its ideas than its final execution. I did genuinely enjoy Michael Kamen’s score for this movie. I think this film gave science fiction media a nice wealth of concepts and designs that helped give rise to more-interesting worlds and settings, such as that found in Dead Space. I can say that I even enjoyed some of the first half of the film, but toward the end it descends into mindless shock value, and fails to deliver any meaningful, lasting impression on this reviewer. It is, as of this review, available for streaming on Netflix. I would consider it worth watching once, but unless you are a horror or gore junkie, that once is probably enough. Image courtesy of http://www.imdb.com. This article is for entertainment and informational purposes only. Event Horizon is a Paramount Studios copyright; no copyright infringement is intended.